Yellow fever is a fatal mosquito-borne disease prevalent in tropical and sub-tropical Africa and South America. The causative virus is transmitted primarily by Aedes aegypti, a type of mosquitoes with widespread distribution in the world. Since December 2015, Angola started to have massive yellow fever outbreaks. Due to the close economic relationship between China and Angola, many Chinese workers and businessmen are staying in Angola. If unvaccinated, they may be infected and could bring yellow fever virus back to China when travelling home. 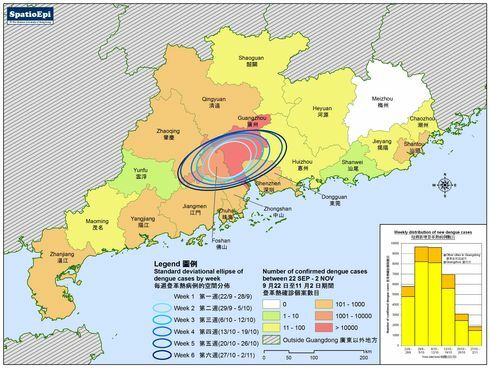 As majority of people in China are not protected against yellow fever, the virus would spread easily in mosquito-breeding season and cause outbreaks. 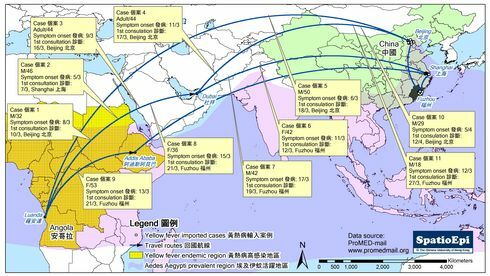 The map shows 11 yellow fever cases in China imported from Luanda, capital of Angola, during 13 March to 24 April 2016. Five cases were imported to Beijing and Fuzhou respectively and one case to Shanghai. The Embassy of China in Angola had expressed that at least 6 Chinese workers in Angola were suspected to have died from yellow fever. Yellow fever is a vaccine-preventable disease. For personal and community health, people who wish to travel to endemic areas in tropical Africa and America should receive yellow fever vaccine 11 days before arrival. Data for this map were derived from statistics from ProMED-mail. Note: Case 6 was vaccinated before symptom onset but had probably been infected already prior to vaccination. Yellow fever is a mosquito-borne infectious disease endemic in tropical and subtropical Africa and South America. Common symptoms of yellow fever include fever, headache, muscle pain, nausea, vomiting and fatigue. Some 15% of patients may develop severe symptoms such as high fever, jaundice, bleeding and multiple organ failure, of which around half die within a week. At the moment there is no effective anti-viral treatment for yellow fever. 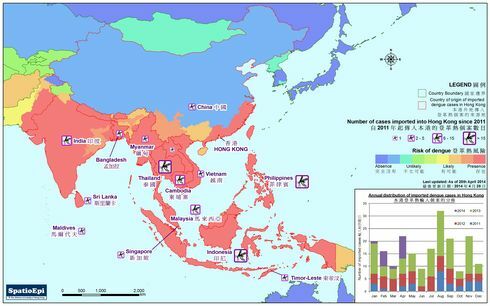 Yellow fever virus is spread through the bite of mosquitoes from the Aedes and Haemogogus genus, primarily Aedes aegypti. 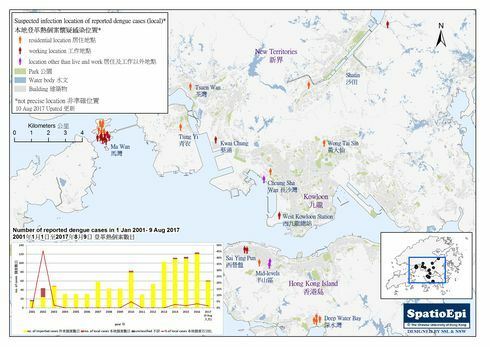 The common Aedes albopictus in Hong Kong and Macao could also be the vector for transmitting yellow fever. Yellow fever is vaccine preventable. Travellers planning on travelling to the endemic countries should be vaccinated 11 days before arrival. The protective effect of vaccination is generally valid for 10 years. Other preventive measures are mosquito controls and personal preventive measures, including the use of insect repellents and wearing protective clothing.